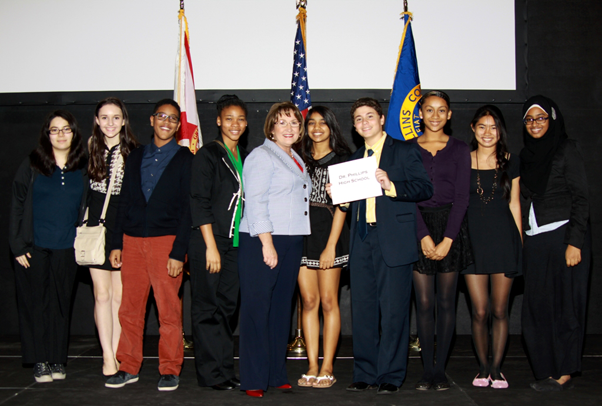 Orange County, FL – As part of her initiative to connect students with their local government, Mayor Teresa Jacobs hosted her third annual Youth Leadership Conference at Rollins College on Friday, February 28. More than 200 student leaders from 21 Orange County Public high schools were in attendance. The students learned more on how their county government functions and how to strengthen their leadership skills. Students who attended the conference had the opportunity to meet and interact with other students from county high schools who are also in leadership roles. Attendees said they aspired to become community leaders in the future and plan to become more engaged in their local government after the conference. This year, students were once again given the challenge to post videos on Facebook, recapping what they learned at the conference, and a chance to “job shadow” their Mayor for a day. Each high school will collaborate on their video and, on March 18, one school will be selected as the winner of the Mayor for a Day Challenge. “The Youth Leadership Conference was very informative for my future in politics,” said Kelly Casanova, a Colonial High School student. Joining Mayor Teresa Jacobs in the conference were Orange County Supervisor of Elections Bill Cowles, Chairman of the Orange County School Board Bill Sublette, Superintendent of Orange County Public Schools Dr. Barbara Jenkins, City Year Orlando Vice President and Executive Director Jordan Plante, as well as members of Orange County’s Board of County Commissioners and school board members. Special guests from the WWE (World Wrestling Entertainment) Superstars and WWE Divas also made a surprise visit and spoke to students. A variety of photos from the conference are available for use by the media and are located on Flickr.